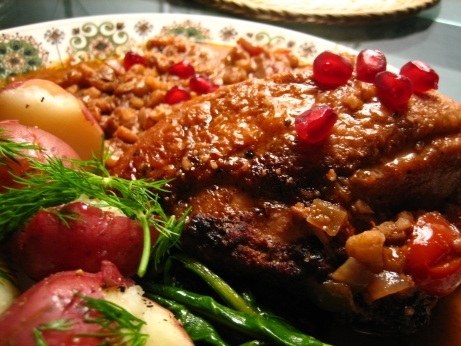 This is a quick chicken stew, made with pomegranate, onions, walnuts, cinnamon, tomato, lemon juice, and molasses. That’s a lot of big bold individualistic flavours in one dish. Apparently this dish is traditionally made with duck instead of chicken. There may have been a very good reason for that. Duck has got a pretty intense flavour of its own, and it can stand up to this sauce. I found that the chicken flavour just got lost. The weirdest thing about this dish is that the sauce is thickened with ground walnuts. I really liked the walnut flavour, and it pairs very well with the pomegranate juice, but the texture was just off. It’s not smooth, it’s not chunky, it’s mealy. Runny undercooked oatmeal comes to mind. I’m also not a huge fan of sweet sauces for meats. This wasn’t candied or anything, but the combination of pomegranate juice, cinnamon, and nuts put my palate in dessert mode. Sweetened fruity stews and I just aren’t destined to be friends. On a more positive note the chicken itself picked up bunch of great flavour. I didn’t eat much of the sauce on it’s own, but it had perfumed the chicken quite beautifully. I also liked having an excuse to break down a pomegranate. The little jewels are gorgeous, and a lot of fun to eat. I wouldn’t make this one again, the sauce had a cohesive flavour, but it was going in a direction I didn’t want to follow. It completely overwhelmed the chicken, and the texture was just bad. Make it at your own risk. I like that photo… it has a cool mix of colours. Too bad the dish doesn’t live up to its presentation. Thanks, this was about the time I started playing around with the digital macro settings. These dishes were cooked during the first month or so of writing the blog, so I started paying more attention to the photography from here on. This dish left my taste buds underwhelmed and coated in a kind of walnut film. It’s too bad you didn’t like this dish. I had the most fantastic Fesenjan this evening. Perhaps yours was poorly done and you should give it another go somewhere else, because I didn’t find the sauce mealy or fruity. The dish I had was more savoury than sweet. While I knew there were walnuts in the sauce, they were too finely ground to give an odd texture. A good friend of mine is Iranian, and this dish apparently plays an important part in her family tradition. She’s still mad at me for this write-up, apparently when done right fesenjan can be fantastic, I just think this recipe wasn’t the best. I’m hoping to get an invitation to one of her family events so I can try the real thing. I have had this dish many times made by a persian friend…LOVED IT!! She did not add tomato, nor cinnamon. She made hers sour not sweet and I think that is the best (Add more lemon.) She also used pomegrante sauce not juice. I agree with who said your recipe you used probably wasn’t good. Also, this dish is traditionally made in the winter like Americans would have beef stew… I have had this dish made by different people and the dish wasn’t as good as my friend Narges. If the walnuts were not gounded finely, it can make the difference. I just tried a different version of this recipe tonight, and it was a big hit with my family. I forgot to take a picture of mine, and went googling it for my blog, and came across yours. I hope you don’t mind if I use your picture, and give you full credit. Let me know if you mind, and I won’t use the picture. I hope you get another chance to try this recipe, and that if you do, you like it better. This is an easy and delicious dish. The recipe I have is totally different than the one you have listed on this page. I use pomegranate paste, chicken, walnuts, onion, and sugar. One of my favourite persian meals. My mom made this a lot for us growing up.